I have never been what you could call ‘outdoorsy’. When I was growing up, I was obsessed with Barbies. The thoughts of climbing a tree or even going for a walk in the woods was enough to have me scrunch up my nose in derision. In 2013, when my sister and her family were visiting from England, I was invited to accompany them up Bray Head in search of ‘geocaches’. They made several attempts to explain to me what it was all about but I really didn’t get it. I went along regardless and once we found the first geocache of the day, I was hooked and have been ever since! Geocaching is best described as a worldwide treasure hunt using GPS coordinates to locate containers hidden by other geocachers. The ‘treasure’ is not really the container that you find, but rather the adventure that you went on to find it. If someone asks me what geocaching is, I usually answer “we use million-dollar satellites to find lunchboxes in the woods.” Sounds crazy, doesn’t it? 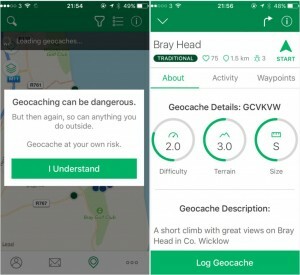 There are currently over 8,000 geocaches hidden in Ireland and the game is growing exponentially, as the availability of GPS navigation on phones has opened it up to a whole new audience. Previously, you had to have access to a handheld GPS receiver to play the game and they didn’t come cheap. The app will pick up your location and show you the geocaches around you. Choose one and off you go! What you’ll find when you get to the cache site (‘ground zero’) is typically a small container such as a watertight lunchbox, containing at least a logbook, but sometimes a pen or pencil (always safest to bring your own) and occasionally so-called ‘swag’ (stuff we all get), which are little trinkets that can be swapped with items of equal or higher value. For kids, the swag is sometimes the best part – the real treasure, if you like – but not all geocaches contain swag items, so expectations should be kept in check! For the best chances of finding swag, make sure you choose a container marked as size small, regular or large. 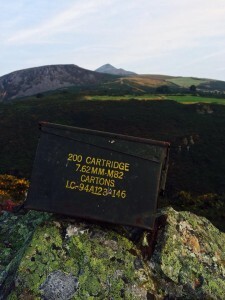 Details of each container can be found on geocaching.com or in the cache description on your app. Once you’ve found the geocache, you should write your geocaching username in the logbook and replace it exactly as you found it, trying to make sure muggles (non-geocachers) don’t become overly interested in what you’re doing. If you’re using the app, you can write your ‘Found It!” entry straight away. Otherwise, you can log it on the website when you get home. 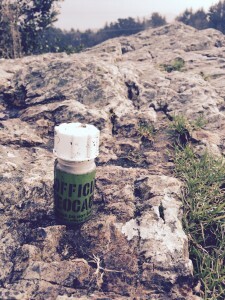 Some geocaches are easy to get to but others require a long hike, so you should check all details on the cache description before setting out, especially difficulty and terrain ratings. The higher the difficulty, the harder it could be to locate the geocache – some of them are really well camouflaged. The higher the terrain, the more of a hike or climb it will be. If you choose a higher terrain cache, make sure you’re prepared and pack some water and snacks, and of course, wear suitable shoes! If you are bringing kids along, make sure to pack some swag items that they can trade if they find something they want to take. Things like bouncy balls, foreign currency, keyrings or similar are great trade items. Geocaching is a fantastic way to see hidden places in your own town that you may not have known about. Caches can be hidden in remote places like forests, mountains and woods but also in urban locations, where they typically highlight an interesting building or historically important place. It’s not just an activity for families. There is a great geocaching community in Ireland, with various events held regularly, including CITO events (Cache in Trash Out®), an ongoing environmental initiative to clean up the environment where we play. I cannot recommend enough trying out geocaching, especially if you’re travelling somewhere new. Geocachers will place caches in places that guidebooks won’t bring tourists, so you can really get a feel for the place when you look for caches in places off the beaten track. On the way to Achill Island last summer, we stopped off to find a geocache and found ourselves at the beautiful Burrishoole Abbey, not far from Newport, County Mayo. A fabulous location brought to my attention by the geocache placed there. Who needs tourist guides when you can just go from cache to cache! If you’re looking for something to do at the weekend and want to get outdoors, why not give geocaching a try. You might be pleasantly surprised where it takes you. Sarah Murphy is a blogger working 9-5 to pay for her next adventure. 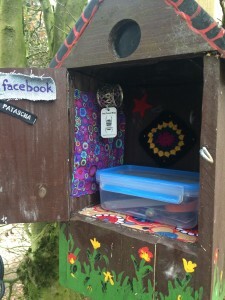 When she’s not travelling the world or planning her next trip, she spends her weekends discovering hidden corners of Ireland thanks to her other passion: geocaching. We found a cache in the walls of Derry. And, funnily enough, we weren’t looking – i just happened to spot it. But you can bet I logged in to the geocaching app to record it!